There’s been so much exciting news this week. Finally, the Star Wars Galaxy’s Edge opening date has been announced, and we are already counting down the days until we get to go! 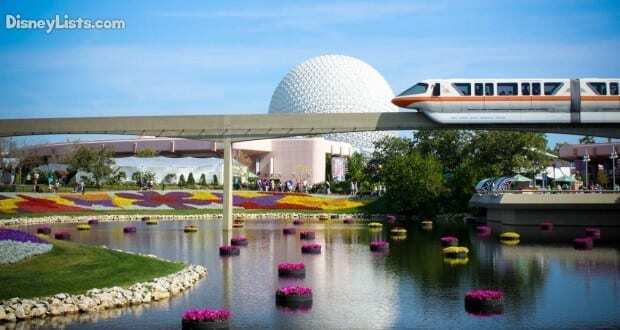 The Epcot Flower and Garden Festival opened this weekend, and Disney also announced there will be even more new food options around the resort! Kids now have the opportunity to become a pirate or mermaid at select Walt Disney Resorts, along with other experiences opening up at the hotels. Victoria & Albert’s received the Illustrious AAA Five Diamond and Forbes Travel Guide Five-Star Awards (again). To learn more about this exciting news and more, read below! Disney World and Star Wars fans celebrated this week because Disney finally announced the opening dates for Star Wars: Galaxy’s Edge for Disneyland and Disney World. What was surprising about the announcement is that the new land in Disney’s Hollywood Studios will be opening earlier than anticipated. The new land will open on August 29, 2019, just in time for Labor Day weekend. Disney will open the land in “phases,” with everything except Rise of the Resistance opening on August 29. (Rise of the Resistance will open later this year). Also, be aware that FastPasses will not be available, even to Disney World resort guests for the initial opening. (No word on when FastPasses may be offered). However, Galaxy’s Edge will be included in Extra Magic Hours which will give resort guests the ability to line up and enter first. Disney is warning all guests to expect delays and closures based on capacity limits. No one is guaranteed entry into the land–not resort guests, annual passholders, or simply those who have an admission ticket to Hollywood Studios. We will continue to keep you posted on the developments of the new land! Read everything we know about the land and what to expect by clicking here. On Wednesday, March 6, the 26th Flower and Garden Festival opened! Epcot was surprisingly busy for this opening day. We’ve been to many openings in the past, and this one was certainly the busiest. Cars were backed up to World Drive waiting to get into Epcot! It took Cindy forty minutes to get into the park from the time she lined up on World Drive to the moment she stepped through the gate! It was a beautiful, cool day, and everyone was enjoying the smell of the flowers, the new topiaries, and the outdoor kitchens. The Orange Bird Sippy Cup was the hot item of the day, with waits for the drink and cup ranging from about 20-40 minutes! If you get a chance, we highly recommend visiting this fantastic festival! Click here to see photos of all of the Outdoor Kitchen Menu Boards to see pricing and eligible snack items. Click here to see photos and prices of the 2019 Festival merchandise. Click here to get an overview of what you can expect to find at the festival. I am SO EXCITED to announce that the Mac & Cheese Truck will be the latest addition to the fleet of food trucks parked on the West Side of Disney Springs, serving up a selection of mouth-watering mac and cheese dishes! Chow down on the Crunchy Mac-N-Cheese with six different cheeses and topped with crunchy cheese puffs or perhaps the Bacon Cheeseburger Mac-N-Cheese with creamy cheddar and American cheese mixed with ground beef and topped with bacon, shredded lettuce, tomato, sliced pickles, ketchup, mustard, and crispy potato sticks. Other options include a delicious Italian-inspired Chicken Parmesan Mac-N-Cheese with Alfredo sauce topped crispy fried chicken, marinara sauce, Parmesan cheese, and basil and the Smoked Brisket Mac-N-Cheese made with cheddar and smoked gouda and topped with tender smoked brisket, sweet and tangy barbecue sauce, crispy onion rings, and chives. For a yummy seafood option, try the Lobster and Shrimp Mac-N-Cheese with cheddar and Swiss topped with buttery lobster, shrimp, and crackers. Be sure to keep an eye out, because the Mac & Cheese Truck will be rolling into Disney Springs in March! Also at Disney Springs, B.B. Wolf’s Sausage Co. has added a few new items to the menu. There are three new foot long hot dogs: the Hawaiian Island Dog topped with grilled pineapple salsa, spam, and teriyaki; the New York Pastrami Reuben Dog topped with shaved pastrami, Swiss cheese, sauerkraut, and Russian dressing; and the Texas Chili Cheese Dog topped with chili, cheddar cheese, and corn crisps. If you’re looking to try a little bit of each, then you can order the Three Little Pigs Hot Dog Sampler with mini versions of all three specialty dogs! 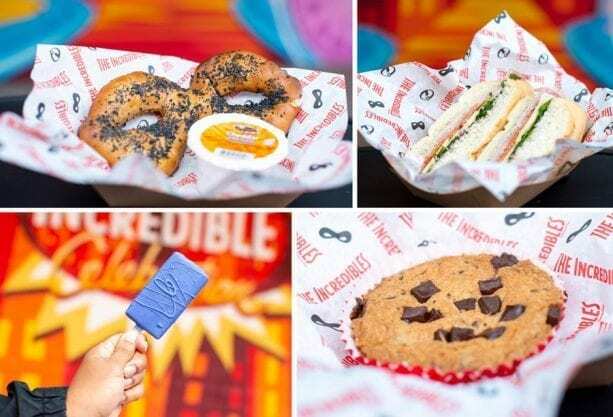 Next, there’s a new bakery in town at Disney’s Hollywood Studios – the Neighborhood Bakery at An Incredible Celebration on Pixar Place is serving up super tasty eats inspired by everyone’s favorite superheroes. Savory bites include the limited-time Mask Pretzel (served with cheese!) and the Incredible Hero Sandwich with Italian meats and cheeses and an olive tapenade. For a sweet treat, take a bite out of a warm Num Num Cookie or a Key Lime Pie on a stick! If you’re feeling a little thirsty, you can also sip on the blue raspberry Frozone Slush with whipped cream or the Secret Identity with frozen Coca-Cola and cherry cotton candy. You can even top them off with a fun Pixar-themed novelty straw. At Disney’s Animal Kingdom Theme Park, Tiffins Restaurant recently changed up the kids menu. Kiddos dining at the restaurant can now choose from Shredded Beef Tacos with queso fresco; Bunny Chow featuring brioche stuffed with a curried stew of root vegetables and plant-based protein; Grilled Shrimp with ginger-tamari sauce; or White Cheddar Macaroni and Cheese. And after dinner, they can satisfy their sweet tooth with a Cookies and Cream Brownie or Tres Leches (triple-soaked vanilla sponge cake). For those kiddos that dream of being a pirate or mermaid, that dream can now come true with the brand new Pirate and Mermaid Experiences at select Disney World Resort hotels. Other cool new experiences will also be opening up at select resorts. A variety of new experiences – from art classes and fishing excursions, to pirate experiences and mermaid schools and more – are already, or will soon be, available to book at Walt Disney World Resort hotels. Ahoy, mateys! Reservations are now open for a new group experience that invites young recruits ages 4-12 into the world of pirate feasting and treasure seeking, high-energy sailin’ and swashbucklin’ fun. The new Captain Hook’s Pirate Crew at Disney’s Beach Club Resort teaches youngsters pirate ways and lets them follow clues that will lead to hidden treasure and being named to Captain Hook’s Pirate Crew. Armed with clues, young buccaneers will comb through the resort and set sail on a pontoon boat around Crescent Lake, in the latest seafaring adventure at Disney’s Beach Club Resort. Once the treasure is unearthed, all join in a Pirate feast that includes selections such as Cannon Meatballs with marinara or macaroni and “gold” sauce for entrees, along with a treasure chest treat or fruit for dessert. Captain Hook’s Pirate Crew is priced at $55 per child (plus tax); the adventures begin April 28. For more information or to book a reservation, call 407-824-KIDS. Guests can become part of Ariel’s world at the Mermaid School at select Walt Disney World resort hotels. Guests ages 4 and older can enjoy an hour-long class where they’ll be fitted with a swimmable “tail” and led through activities teaching them how to swim in a pool like a mermaid. Mermaid School will be offered on select dates at Disney’s Art of Animation Resort, Disney’s Caribbean Beach Resort, and Disney’s Yacht and Beach Club Resorts. Classes are $50/person (plus tax). Bookings will open mid-March through 407-WDW-PLAY. These new cabanas are exclusively for guests staying at Disney’s Yacht and Beach Club Resorts. Reservations for half and full day rentals are now open for dates beginning March 17 through 407-WDW-PLAY. All-new master classes led by professional artists at select Walt Disney World resort hotels will have guests creating their own masterpieces. Classes range from $35 (plus tax) to $50 (plus tax) per person, offered to ages 12 and older for most experiences. Painting on de’ Bayou (adults), Painting by the Lagoon (kids), Disney’s Port Orleans – French Quarter Resort. NOTE: children’s painting class is $30 per person (plus tax); designed for ages 6 and older; accompanying parent required. 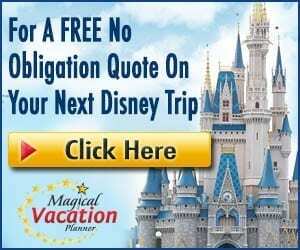 Bookings (select dates per resort) are available through 407-WDW-PLAY. Whether a seasoned sportsman or amateur angler, guided excursions or dockside fishing in the waterways of Walt Disney World Resort are great fun for guests of all ages. Aboard a 21-foot SunTracker pontoon (up to five guests) or a tournament-style NITRO bass-fishing boat (for one or two participants), teeming Disney waters are an angler’s dream. Outings (two or four hours) are catch-and-release. The fleet has been joined by a new NITRO ZV21, operating out of the Magic Kingdom marinas. 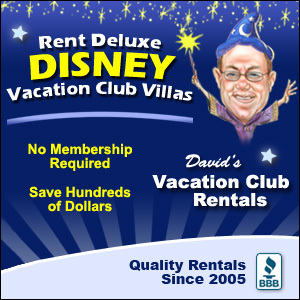 For more information or to book an excursion, guests can call 407-WDW-BASS. We all know and love the Bibbidi Bobbidi Boutique experience because it gives kids a chance to become their favorite Disney Princess. Now kids have the change to do the experience aboard the Disney Ships. Woo-hoo! Best. Day. Ever! 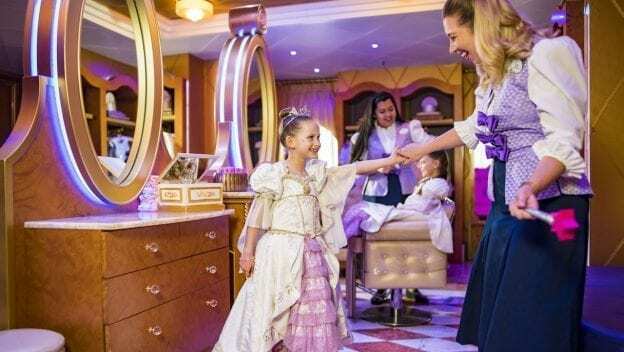 Now aboard all four of our ships, your child’s dream of being a princess can come true with a new Signature Rapunzel makeover at Bibbidi Bobbidi Boutique. Truly fit for royalty, the stunning, heirloom-quality gown features a latticed bodice and rich fabrics. To complete the look, Fairy Godmothers-in-training adorn your little princess with a crystal tiara, a gold-plated sun pendant necklace, and a gold-plated and sterling silver bracelet with pink, purple and white Swarovski stones. Add the princess shoes and sash, imperial hairstyling, nail polish, shimmery makeup, and sparkling face gems, and the royal transformation is complete! This new Signature Rapunzel package also includes an ultra-luxurious white robe with lavender trim and crown embroideries, plus an organza garment bag and a satin hanger. You can book makeovers at Bibbidi Bobbidi Boutique online at DisneyCruise.com in advance of embarkation or onboard the ship during your cruise. Only a select few restaurants are approved and highly rated with either the prestigious AAA Diamond or Forbes Travel Guide Stars awards each year. It is with great pleasure we announce two of our Disney restaurants received these impressive accolades for 2019 – Victoria & Albert’s at Disney’s Grand Floridian Resort & Spa. Victoria & Albert’s has received the renowned AAA Five Diamond Award each year since 2000 and, for the second year, the coveted Forbes Travel Guide Five-Star Award. Victoria & Albert’s is the only restaurant in the state of Florida to be awarded both the AAA Five Diamond and Forbes Travel Guide Five-Star Awards – with only 26 other restaurants in the United States holding both awards. Every night, Victoria & Albert’s brings guests the ultimate in fine dining with classic Victorian elegance, haute American cuisine, and an atmosphere of refined opulence. AAA rates and approves nearly 32,000 restaurants throughout the United States, Canada, Mexico, and the Caribbean. Only 0.2 percent of the restaurants are awarded the AAA Five Diamond rating, and 2.1 percent receive the AAA Four Diamond. These ratings represent a combination of overall food, service, décor, and ambiance. Out of the over 1,600 restaurants across the globe rated by Forbes Travel Guide, only 69 restaurants received the preeminent Five-Star rating. Forbes Travel Guide’s expert inspectors anonymously test each restaurant against up to 900 rigorous standards. Only the best of the best achieve the esteemed Five-Star rating. Congratulations to the Victoria & Albert’s team for earning these distinguished and celebrated awards. For reservations for Victoria & Albert’s, call 407-WDW-DVNA (407-939-3862) or go online to book the Dining Room or Queen Victoria’s Room up to 180 days in advance. For more information, visit www.victoria-alberts.com.